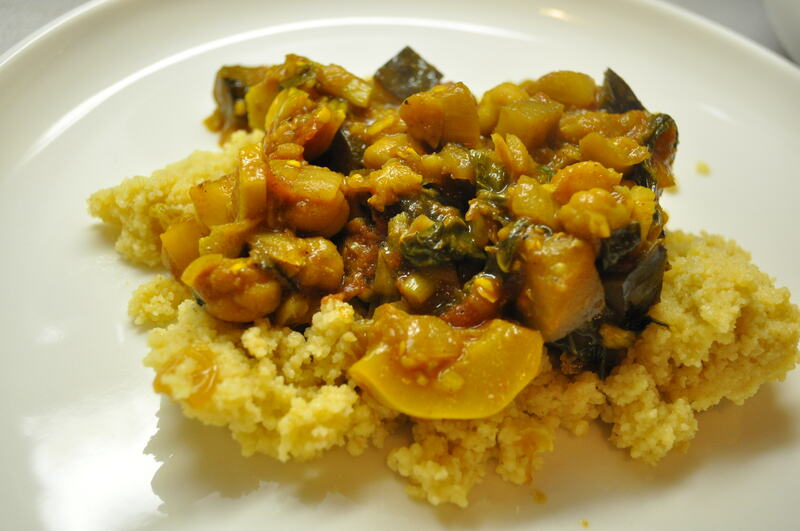 This recipe is adapted from the New York Times. What an excellent and hearty meal! For the biscuits: In a bowl, whisk together the flour, cornmeal, sugar, baking powder, baking soda and salt. Using a pastry cutter or fork, cut in the butter until mixture resembles coarse crumbs. Fold in the sour cream. Gently knead mixture until it comes together in a ball, adding a drop or two of milk if necessary. Cover with plastic wrap and refrigerate until ready to use. For the ratatouille: In a bowl, toss eggplant and zucchini with 5 tablespoons oil; season with 3/4 teaspoon salt and 3/4 teaspoon pepper. 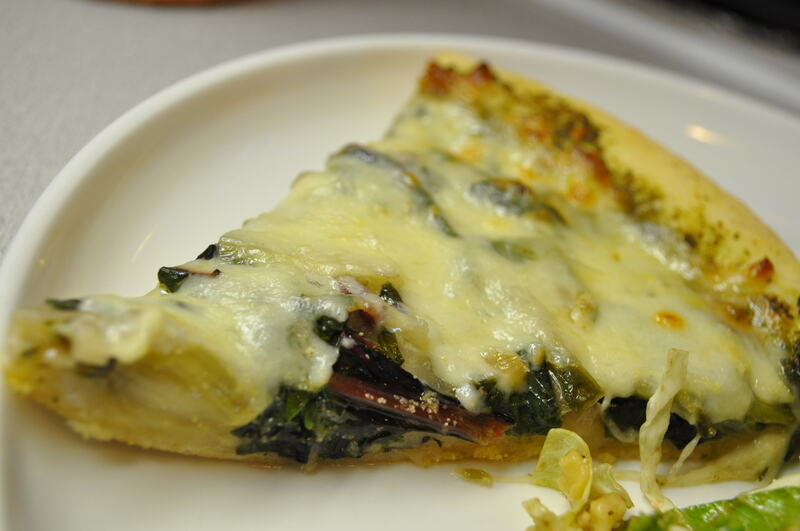 Spread vegetables in a single layer on one or two large baking sheets (do not crowd vegetables). Transfer to oven and roast, tossing occasionally, until golden, about 20 minutes. Meanwhile, in a large, deep, preferably oven-proof sauté pan, heat 1 tablespoon oil. Crumble sausage into pan and cook over medium heat, stirring occasionally, until golden, about 7 minutes. Use a slotted spoon to transfer sausage to a paper towel-lined plate. Return pan to medium heat and add remaining 1 tablespoon oil. Stir in the onion, pepper, garlic and remaining 1/4 teaspoon salt. Cook until softened, 5 to 7 minutes. Stir in the tomatoes and thyme; simmer gently until tomatoes are cooked and mixture is stew-like, about 5-10 minutes. Stir in the sausage, roasted vegetables and pesto. 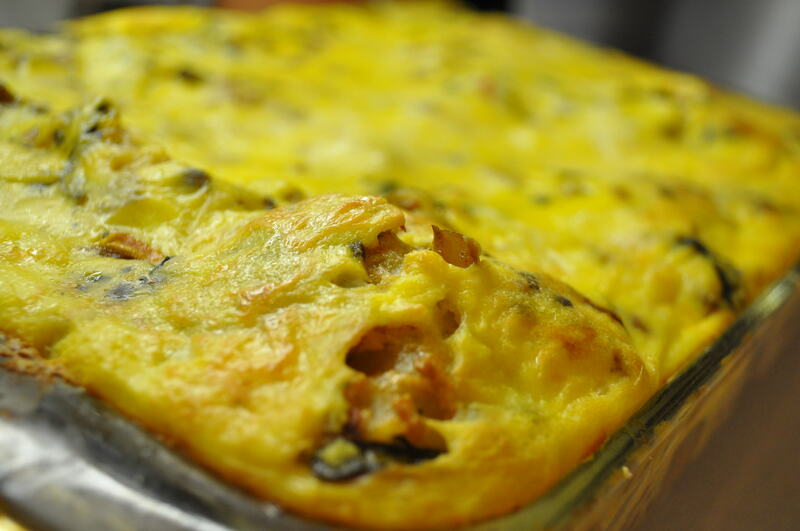 If you are not using an oven-safe pan, transfer mixture to a 2-quart gratin dish or baking pan. 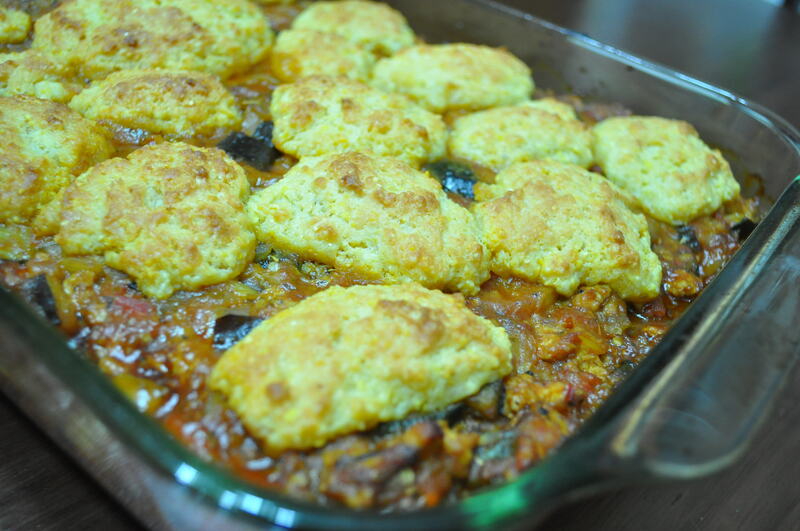 Drop soup spoon size spoonfuls of biscuit on top of ratatouille mixture. Brush biscuits lightly with milk. 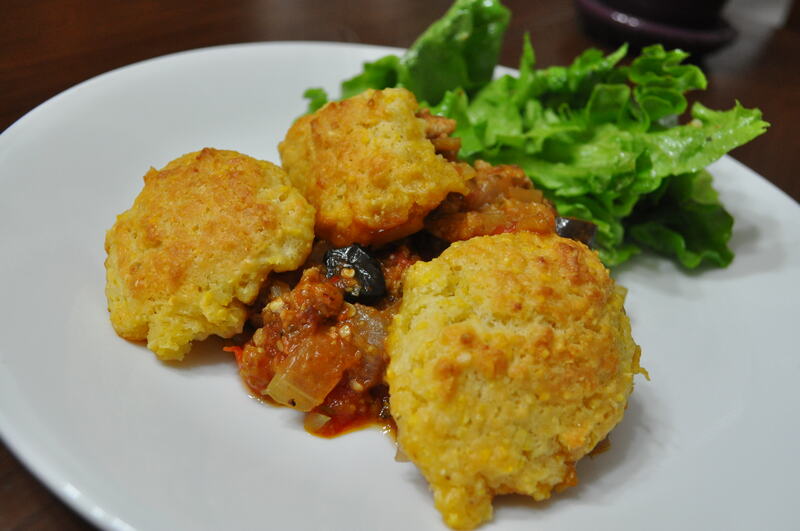 Transfer skillet or pan to oven and cook until biscuits are golden, 25 to 30 minutes. Let cool 10 minutes before serving. Adapted from a Gourmet recipe. In a food processor or blender, chop fine onions, garlic, and ginger. Add water and purée to a paste. In a large heavy casserole heat oil over medium heat. Add onion/ginger paste and cook, stirring, 1 minute. Add curry powder and cook, stirring, 1 minute. Add coconut milk through squash. Increase heat to medium-high and bring to a soft boil. Reduce heat to low, cover and simmer for 5 minutes. 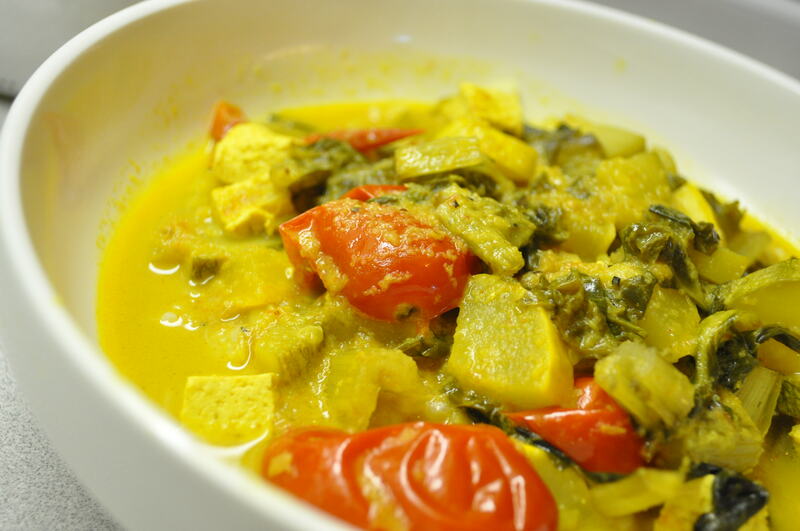 Add tofu through swiss chard and simmer, cover and simmer for an additional 1o minutes until all vegetables are tender and tomatoes are wilted. Discard jalapeno, cinnamon stick, and clove. 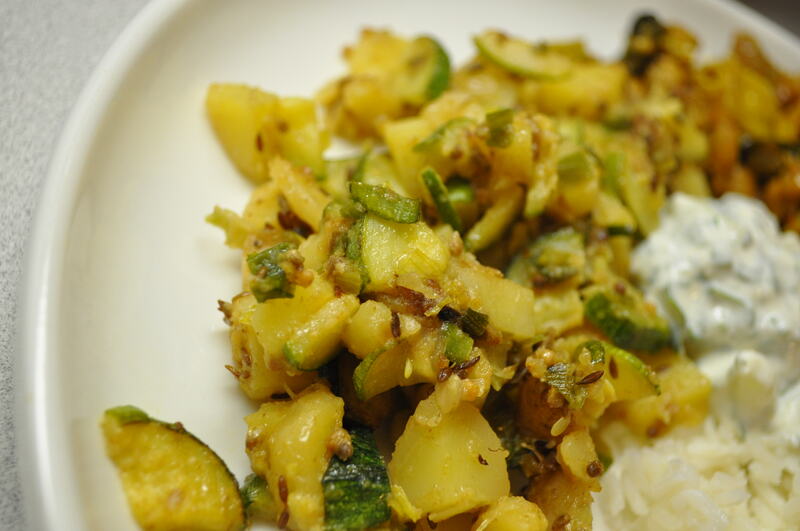 Sprinkle with thai basil or cilantro and serve with cooked, short-grained white rice. 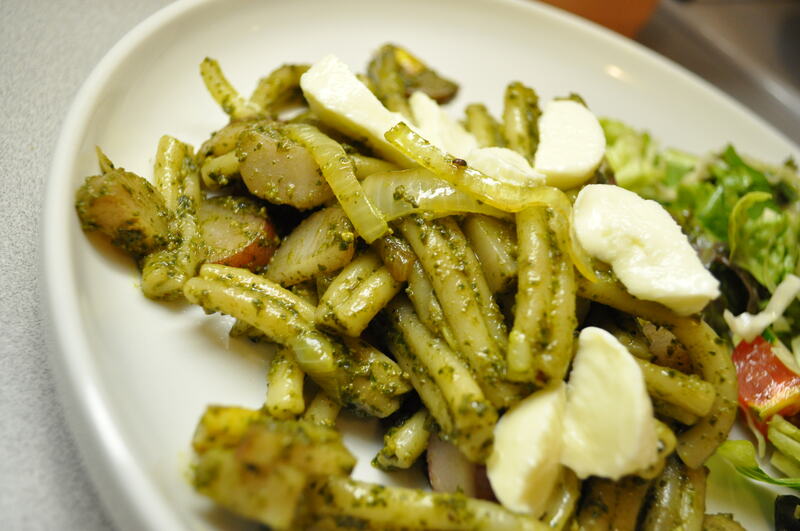 Coat each side of vegetable slices evenly with olive oil. Sprinkle with freshly ground salt and pepper. Set aside. Bring grill to medium heat. Grill eggplant slices for 8-10 minutes (4-5 minutes on each side). Set aside. Grill zucchini, red bell peppers and onions on medium heat for 6-8 minutes (3-4 minutes on each side). Set aside. Coarsely chop grilled vegetables into 1 inch pieces. In a large bowl combine coarsely chopped vegetables and mix well with red pepper through lemon juice. 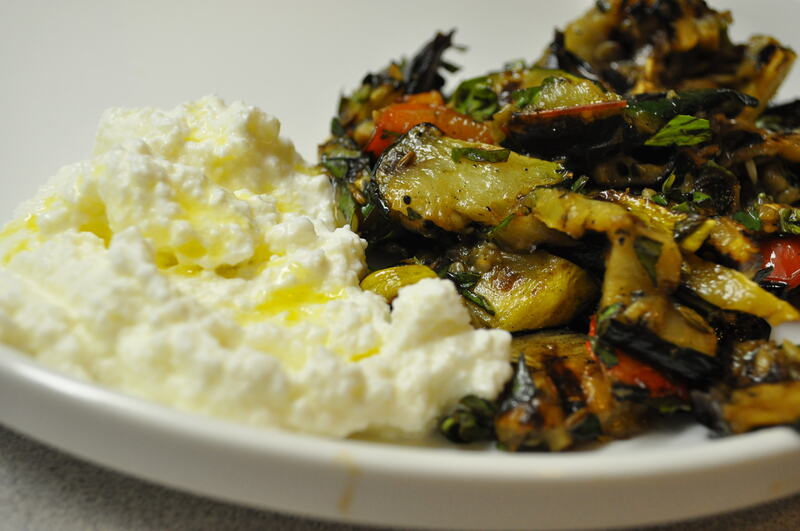 Serve with a dollop of ricotta alongside the grilled vegetables. Slice or chop all the vegetables. Heat olive oil in a large cast iron skillet wok (or other large skillet). Add onions and garlic (or garlic curls). Saute for 5 minutes, or until they begin to brown. Add summer squash and swiss chard, saute for another 5 minutes, or until squash begins to brown. Remove from heat, and set aside. Sprinkle cornmeal on a large pizza stone. Roll out pizza dough on the pizza stone. Bake rolled out pizza dough in the oven for 5 minutes. Remove from oven, and spread pesto evenly over pizza. Sprinkle with 1/3 of the cheese, then top with vegetables, and the rest of the cheese. Bake at 475 for about 10 minutes or until the crust is golden brown and the cheese is melted. In a large cast-iron wok (or other large skillet), heat oil on medium high heat. Add onion and summer squash. Saute for 4 minutes or until they being to brown (stirring only occasionally). Add garlic, saute for another 2 minutes. Add swiss chard and black beans and saute for 4 minutes, or until swiss chard is tender. On a cutting board or large plate prep the quesadillas: sprinkle a little cheese on one tortilla, spoon about 1/2 cup of swiss chard mixture on top of cheese, spread evenly up to the edges of the tortilla (you may need to add more or less of the swiss chard mixture depending on the size of the tortilla – ideally you want about a 1/2 inch thick layer of swiss chard mixture on each tortilla), top with a little more cheese and another tortilla. Spray the frying pan with cooking spray. Add one prepared quesadilla, spray top with additional cooking spray. Cook until browned on one side and then flip and cook other side until crispy and brown. Repeat for remaining quesadillas. 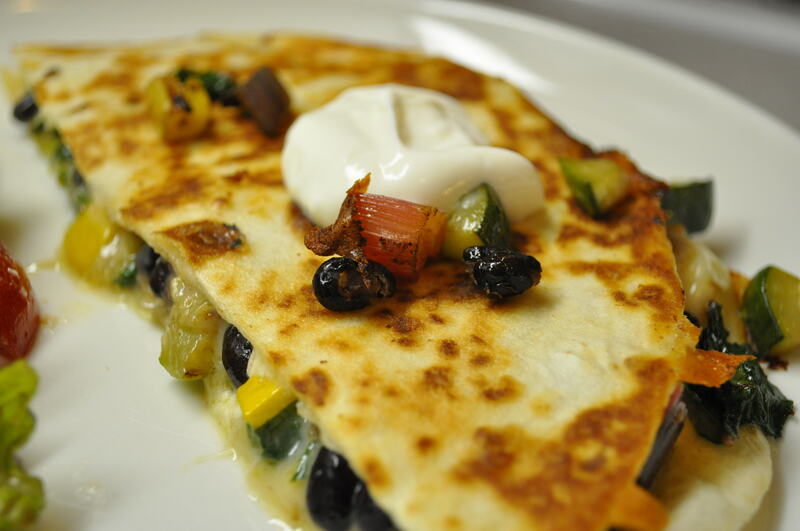 Top quesadillas with a dollop of sour cream. Separate stems from the leaves of the swiss chard and beet greens. Chop the stems and set aside. Coarsely chop the leaves, set aside in a different bowl. Heat olive oil in a large, cast iron skillet (or other large skillet) over medium-high heat. Saute onions and garlic curls for 5 minutes, or until they begin to brown. Add chopped zucchini and the stems of the swiss chard and beet greens. Saute for another 5 minutes. Add the leaves of the swiss chard and beet greens. Saute for another 2-3 minutes, or until the leaves are just wilted. Season with salt and pepper and set aside. 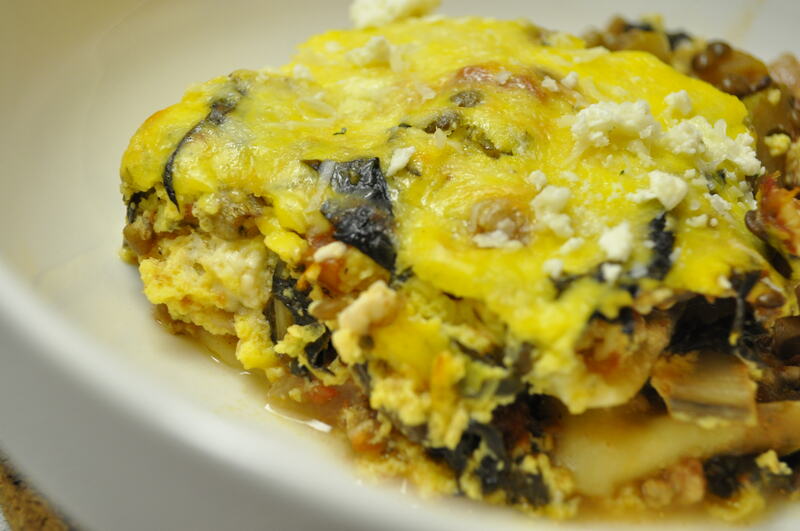 Combine eggs and grated gruyere cheese in large bowl. Add the vegetables, and stir until well blended. Roll out thawed puff pastry, and carefully use it to cover the bottom of a 9X13″ baking dish prepared with cooking spray (the puff pastry should be large enough to cover the bottom and sides of the baking dish, with extra hanging over the edges). 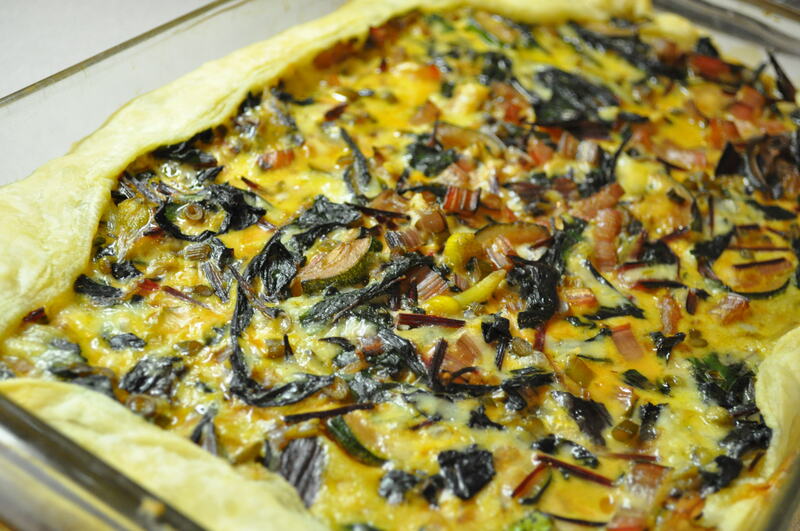 Add tart filling (vegetables, cheese and egg mixture). Carefully, fold over the edges of the puff pastry, on top of the filling. Bake at 425 for 10 minutes. Turn down heat to 350 and bake for an another 15 minutes, or until the tart filling is cooked through. Remove from the oven and allow to rest for at least 10 minutes before serving (preferably longer). Serve with a simple summer salad.